Today - Professor Valenzuela builds a birdhouse! This summer the Office of Study Abroad is running a program for students to travel to Nicaragua and work with Habitat for Humanity to build a home for a family in need. In order to raise awareness for this program, engineering professor Mark Valenzuela will be building a birdhouse; but there’s a twist! He will be forced to build the birdhouse without any instructions, tools, or knowledge of what the final project will look like. However, you can help Valenzuela build the birdhouse by attending an event today - Thursday, February 23 - in the North Lobby of Koch Center for Engineering and Science from noon-1:00 p.m. Those attending can answer trivia questions, and for each question answered correctly, Valenzuela will receive a crucial tool/piece of information to finish the birdhouse. Attendees will also be encouraged to bet on how long it will take to complete construction, and the person with the closest time will receive the birdhouse! Come kill two birds with one stone by grabbing some free snacks/refreshments and learning about Nicaragua and the Habitat for Humanity trip! If you have any questions about the event, e-mail gb91@evansville.edu. The Jostens ring representative will be on campus February 23 as part of Commencement Central. ANYONE interested in purchasing a class ring is welcome to visit with the representative to look at samples and design a ring. Hours are 11:00 a.m.-2:00 p.m., TODAY, just outside the UE Bookstore. Jostens will have special pricing and will also be introducing its new UPLOMA line for spring graduation. Browsers welcome! The University of Evansville Department of Theatre proudly presents its third production of the season, Lauren Gunderson’s Silent Sky, in Shanklin Theatre, at 7:30 p.m. tonight and tomorrow, and 2:00 p.m. on Sunday. Professor of theatre Diane Brewer directs Silent Sky. Theatre department chair Eric Renschler serves as the scenic designer; Ivy Karlsgodt, a senior from San Antonio, Texas, is the costume designer; Avery Reagan, a senior from Conyers, Georgia, is the lighting designer; Benjamin Phillips, a senior from Fort Worth, Texas, serves as the sound designer; Rachel Barkalow, a senior from Cincinnati, Ohio, is the dramaturg; Mary Claire Smalley, a junior from Nashville, Tennessee, is the stage manager; and professor Chuck Meacham is the technical director. The cast features sophomore Madeline Easley, from Overland Park, Kansas, as Henrietta Leavitt; sophomore Kathleen Finch, from College Station, Texas, as Margaret Leavitt; freshman Luke Lowrance, from Arlington, Texas, as Peter Shaw; freshman Shannon White, from Rockwall, Texas, as Annie Cannon; and junior Zoie Quinn, from San Antonio, Texas, as Williamina Fleming. Ticket prices are $15 for adults and $13 for senior adults, students, and UE faculty and staff. UE students may obtain one free student rush ticket beginning at noon on the day of the performance they wish to attend. Following Silent Sky, the Shanklin Theatre Season closes with Hamlet, by William Shakespeare, April 7-15, which marks the 50th anniversary of Shanklin Theatre. Tickets may be purchased by calling 812-488–2031, Monday-Friday, from noon-5:00 p.m. Recently the young son of one of UE’s housekeepers was mauled by a dog, injuring his face and dominant hand and arm. He is facing several surgeries to repair the damage. To help with expenses, the housekeeping department is planning to sell Krispy Crème doughnuts as a fundraiser on TODAY - Monday, February 27, 7:00-10:00 a.m., on the first floor of Ridgway University Center. A gofundme account has also been set up to help with the boy’s medical bills. Nerd Wars: the intellectual battle you don't want to miss! Nerd Wars is a trivia-style contest consisting of multi-categorized questions answered by teams of UE students, faculty members, administrators, and staff members. Come see your friends and professors duke it out! The contest, held on February 28, begins at 7:00 p.m. in Eykamp Hall, Ridgway University Center. Venturing Crew spring break trip: deadline soon! Join Venturing Crew for spring break. From March 4-10, camp on the beach in North Carolina! For only $150, Venturing Crew members will have a fantastic week boogie boarding down sand dunes, kayaking, visiting lighthouses and the Wright Brothers' historical landmarks, and eating seafood on the East Coast. If this is how you want to spend spring break, sign up at Ridgway University Center lobby tables from 11:00 a.m.-2:00 p.m., and 5:00-7:00 p.m. on Monday, February 27 or Tuesday, February 28. If you have any questions or would like more information, please e-mail venturing@evansville.edu. Discover how change can behave like an elephant, but not treat it like a mouse to be afraid of. Join us on February 28 for Lunch and Lead at 12:30 p.m. in Eykamp Hall, Room 252, Ridgway University Center. In this Lunch and Lead, Michael Austin, executive vice president for academic affairs, will explain how to harness the tremendous power of institutional transformation without unleashing the destructive forces that are always inherent in times of change. This event is free and open to all students, faculty, and staff, and UE community members. We encourage attendees to bring their lunch with them to these events. The Black Student Union is taking students to visit the Ali Museum on Saturday, February 25, in Louisville, Kentucky. The students will travel, visit the museum, and see the movie Get Out free of charge because of the generous support of the Student Government Association. The only cost is your own lunch and snacks. Departure from UE is at 8:30 a.m. and we will arrive back in town at 7:00 p.m. Seating is limited but if you are interested in attending please contact LaNeeca Williams at lw161@evansville.edu or by phone at 812-488-2413 to reserve your spot. This is in celebration of Black History Month at the University of Evansville. All are welcome to join us for mass this Sunday at 1 p.m. in Neu Chapel. Fr. Alex will be our celebrant. Hope to see you there! For more information contact Olivia Voegerl at ov4@evansville.edu. Are you contemplating a career in medicine? Thinking about going to professional or graduate school? Not sure what you want to do for the rest of your life? Learn about your career options at the SAMS career colloquium! The next installment of the career colloquium series is tonight from 7:00-9:00 p.m. in Room 101, Koch Center for Engineering and Science. This is an informal event - pizza will be served - and you will have lots of opportunity to ask questions. This career series is designed to introduce you to the wide variety of job opportunities available for students interested in science or math. The speakers at the colloquium are working in or towards various careers, and they will share insight about their career paths and relate their college experiences to their current careers. Regardless of your eventual career goals, you will find their insights helpful and relevant. The first lecture in the 2017 University of Evansville Scholars for Syrian Spring Speaker Series is set for Thursday, March 2. Immigration experts and attorneys David Guerrettaz and Abby Seif will be the speakers. All lectures in this series are at 6:00 p.m., in Room 162 (Harkness Hall), Schroeder School of Business Building, and will be followed by a panel discussion with UE Syrian students and discussion with the audience. This series is sponsored by Scholars for Syria. The topic of Guerrettaz and Seif’s lecture will be “Immigration, Green Cards, and Asylum: What’s Legal?” They will discuss the debate on immigration, what current law requires of immigrants before they enter the country, and the legal basis of executive orders. They will examine the rationale behind the 9th Circuit Court’s recent decision. They will talk about current immigration laws and procedural details on what is required to seek asylum and/or green cards in the US. Guerrettaz is an attorney with Ziemer, Stayman, Weitzel & Shoulders, LLP in Evansville, Indiana, and Seif is an attorney with Epstein Cohen Seif & Porter, LLP in Indianapolis, Indiana. ALL SPRING graduates should attend either session of Commencement Central to finalize their graduation plans. It only takes a few minutes to meet with the offices of the registrar, alumni relations, and career planning, and obtain your cap and gown and/or announcements if needed. Please attend either today - Wednesday, February 22 - from 4:00-6:00 p.m. upstairs in the Ridgway Center OR Thursday, February 23 from 11:00 a.m.-2:00 p.m. outside the UE Bookstore. Looking for a full-time professional position? Cooperative education opportunity? Internship? Summer job? Career Day will include over 100 employers interested in hiring you. The event is set for Tuesday, February 28, from 11:00 a.m.-2:00 p.m. in the Meeks Family Court in Carson Center. See registered employers in JobLink. Also, pre-register for the event in JobLink to allow employers to view your resume early! Residence life announces the start of the summer assistant (formerly summer staff) selection process. Any student who is interested in staying on campus this summer can apply for this position. Summer assistants will assist residence life with summer housing and work with any conferences and events on campus over the summer. This position includes a credit for housing for the summer and pay. Applications will be available on Monday, February 27 and will be available until March 17. Next week there will be information tables in Ridgway University Center lobby from 11:00 a.m.-2:00 p.m. on Tuesday, Wednesday, and Thursday. Info sessions will also be held in Room 126 in Hyde Hall at 7:00 p.m. on February 28 and March 1. If you have questions, please contact Justin Coffey at jc534@evansville.edu or Melinda Daniels at md212@evansville.edu. Thanks to all the students who participated in the Collegiate Changemaker Challenge. We are proud of your inspirational ideas and your hard work was evident in your presentations. Watch for the next Changemaker Challenge this fall! Join the Kazees - pledge to recycle! 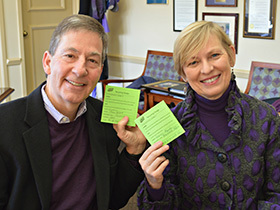 Join President Tom and Dr. Sharon Kazee in pledging to recycle. Fill out a Recyclemania pledge by Feb. 28 and have your name entered in a drawing for one of three beverage coupons from Jazzman’s. The drawing will be held on Friday, March 3. Please email js652@evansville.edu with questions. Professor of history James MacLeod was interviewed by the Courier & Press and Eyewitness News (Channel 25) for In Depth with Brad Byrd about his new book, The Cartoons of Evansville’s Karl Kae Knecht. An article about the book is also currently featured on the Vanderburgh County Historical Society’s website. The interviews and story can be viewed on the Courier & Press, Channel 25, and Vanderburgh County Historical Society websites. Sari Baum, a junior in creative writing and literature, has had her beautiful essay "Bánat is Hungarian for Grief" selected as runner-up in the esteemed Norton Writer's Prize. The Norton Writer's Prize is among the most competitive contests for undergraduate writing, and this is the second year in a row that a UE student has landed in the top three. Walayet A. Khan, professor of finance, co-authored a paper with Ghulam Sarwar, California State University, titled, “The Effect of US Stock Market Uncertainty on Emerging Market Returns.” The paper is forthcoming in the Emerging Markets Finance and Trade (journal), 2017. Khan presented another paper with the same coauthor (under review now) titled,” Examining the Interactions of US Market Risks and Emerging Market Returns in an Integrated System: Global Evidence” at the 2016 annual meeting of the Financial Management Association. Freshman Dru Smith had the top game of his young career as the Evansville native finished with 19 points as Wichita State earned a 109-83 win over the University of Evansville Men’s Basketball team on Tuesday night at Charles Koch Arena. Smith connected on five triples in the game, also a career mark. Leading the squad in scoring was Jaylon Brown, who notched 25 points and added 10 more free throws to his season tally. Duane Gibson was the third double figure scorer for UE (14-16, 5-12 MVC) as he totaled 10. Leading the Shockers (26-4, 16-1 MVC) was Shaquille Morris, who finished with 18. He was one of six double figure scorers for WSU. Evansville took a 4-2 lead in the early-going as Duane Gibson went coast-to-coast before Jaylon Brown hit a triple to give the Aces a 7-5 lead with 17:10 left in the half. A 14-2 run by the Shockers saw them take the first double-figure lead of the game at 19-9. Darral Willis Jr. capped off the run with back-to-back field goals. The Aces battled back as an and-one from Ryan Taylor at the midway point of the period got UE within six at 24-18, but Wichita State made another big push. This time, WSU outscored UE by a 22-8 margin to open up a 46-26 lead with 2:16 on the clock. Three triples by Conner Frankamp made the difference as the Shockers went up by 20. Over the final three minutes of the half, the Aces defense held WSU without a field goal while cutting into the lead. Dru Smith’s third triple of the day helped UE head to the break trailing by 16 points at 48-32. Out of the locker room, Wichita State was at it again as they quickly pushed the lead to 25 points at 62-37 with 16:43 remaining. Just over three minutes later, a pair of Smith free throws got cut the gap to 18 points at 66-48, but the Shockers quickly pushed it back above 20 before cruising to the win. WSU shot 53.8% on the game while UE finished at 49.1%. The Shockers also finished with a 35-26 edge on the boards. Evansville had its highest scoring output versus the Shockers since notching 84 in an 89-84 road loss in 2003. Senior Day is set for Saturday at the Ford Center at noon as Christian Benzon, Jaylon Brown, David Howard, Sergej Vucetic, and Willie Wiley will be honored. Evansville looks to earn the season split against Indiana State in the regular season finale. LaNeeca Williams, chief diversity officer, and four Fellows Scholars will present at the Bringing Theory to Practice conference in Chicago on May 24. The conference is titled, “The Whole Student: Intersectionality and Well-Being.” It is in partnership with the Association of American Colleges and Universities. Williams and the students will facilitate a single institution team panel on "Academic Mechanisms, Social Engagement Opportunities, and Anti-Bias Training: Winning Students of Color at a PWI." The conference will take place May 24-26, in Chicago, Illinois. Women's Swimming and Diving competed in the Missouri Valley Conference Championship this past weekend in Iowa City, Iowa. Three school records went by the wayside in the course of the weekend, and junior Courtney Coverdale earned the first diving title the Aces have received in at least fifteen years with a win in 1-Meter. To top it all off, the 8-time MVC Diver of the Week was named the 2017 Diver of the Year, while Coach Andy Brown was named 2017 Diving Coach of the Year. All-Conference Honorable mention was awarded to Michaela Kent, Kristen Myers, Aine Scholand, and Sam Gowdy. Danielle Freeman and Coverdale received All-Conference First Team. The final standings of the meet were: Missouri State—832.5, Southern Illinois—649, Northern Iowa—615, Illinois State—393.5, Evansville—365, Little Rock—303, Indiana State—148. The 500 freestyle was the first event slated for the night. Participating in the finals were freshmen Aine Scholand and Kristy Kupfer with times of 5:00.51 and 5:09.67, good for 12th and 20th place respectively. Scholand's time was a season best. In this morning's preliminary session, sophomore Bridget Sheridan clocked in at a 5:18.89 for a season best time. The 200 IM came next on the schedule. Senior Taylor Davidson represented the Aces in finals with a 23rd place finish at a 2:10.74. Her preliminary time of 2:09.47 was a season best. Junior Danielle Freeman and senior Michaela Kent both competed in the A-Final of the 50 freestyle and represented well. Freeman clocked in at 23.04, a half second drop from her preliminary time, to earn second place. Kent took seventh place spot on the podium with a 23.34. Freshman Emma Hennessy clocked in a 24.08 for 20th place, and Sam Gowdy's 24.33 was a lifetime best time good for 22nd place. The highlight of the night came in the form of junior Courtney Coverdale, eight-time MVC Diver of the Week. Coverdale took to the boards tonight seeded first after the morning's preliminary round. She came out on top with a final score of 275.35. Her title is the first diving championship Evansville has taken in at least fifteen years. Junior Kasey Rein took 10th place with 188.85 points, and freshman Alyssa Vonder Haar placed 13th with 165.80. To top off an already successful night, the 200 Freestyle Relay team of Freeman, freshman Emma Hennessy, sophomore Kristen Myers, and Kent outtouched the Southern Illinois relay by a mere two tenths of a second to score a third place finish and the final spot on the podium. Their final time was 1:33.10. Kent's final split of 22.6, a lifetime best, was the fastest of the meet, and would have been good for first place in the individual event. Junior Jessi Hildebrand participated in the Evansville C Relay and clocked in a 25.45, a lifetime best 50 freestyle mark. Additionally, sophomore Kaylee Gubricky earned a best time with a 24.00 split on the B Relay. Last year in the 100 butterfly, Kristen Myers took sixth place as a freshman. This year, the sophomore moved up a spot to take fifth place and the school record with a final time of 55.47. Junior Danielle Freeman competed in the consolation final, earning tenth place with a time of 56.68. In the preliminaries, junior Kasey Rein clocked in a lifetime best of 58.89. The 200 freestyle held much individual success for the Aces. Sophomore Madi Jones took 16th in the consolation final, earning points for the Aces in the event for the first time since 2015. Freshman Aine Scholand clocked in a 1:55.37 for 21st place, followed by junior Jessi Hildebrand in 22nd at 1:56.21. Hildebrand's preliminary time of 1:56.06 was a lifetime best. Points were scored for Evansville in the 100 breaststroke this evening, also for the first time since 2015. Junior Kayla Aitken clocked in a personal best time of 1:05.02 for 14th place, while freshman Alaina Sylvester followed at a 1:05.82 for 15th. In the preliminary session, sophomore Sylvia McFadden took a lifetime best with a 1:07.98. Returning MVC champion Michaela Kent took to the water tonight in the 100 backstroke final, this time joined by sophomore Sam Gowdy. Kent snagged fifth place with a time of 55.68, however her time of 55.49 in the preliminary round broke her own school record set last year by .04 seconds. Gowdy touched in shortly after at 56.28 for sixth place. Senior Taylor Davidson took points for the team touching in second in the consolation final for 10th place in a lifetime best time by nearly a second at 57.20. The Aces finished the night with a sixth place finish in the 400 Medley Relay. Kent, Aitken, Myers, and Freeman teamed up to clock in at 3:48.75. Sophomore Kaylee Gubricky participated in the Evansville C-Relay and split a personal best 100 freestyle time of 54.19. Freshman Alyssa Vonder Haar competed in the 3-Meter consolation final. She scored 182.70 points to take 4th place. The final session began with the consolation finals of the 1650 freestyle. Freshman Ashton Adams swam the event in 18:21.98 for a 20th place finish. Sophomore Megan Schremp achieved a lifetime best time at 18:01.25, touching first in the heat and taking 17th overall. Freshman Aine Scholand was seeded 11th when she dove into the pool—she clocked in a 17:12.30. It wasn't until the top 8 seeded swimmers completed the race at the beginning of finals that Scholand took her spot on the podium in 5th place, her first collegiate top 8 finish. Her final time was also a lifetime best. Next on the schedule was the 200 backstroke. Senior Taylor Davidson took to the pool in her very last individual event to emerge the winner of the consolation final. Her final time of 2:02.47 was a lifetime best and good for 9th place. Additionally, it broke her own school record of 2:03.63, set in 2014. Sophomore Sam Gowdy came next for the Aces with a lifetime best of 2:04.47 landing her in 11th place. Freshman Kristy Kupfer took 16th with a final time of 2:06.81, however her preliminary time of 2:06.62 was a lifetime best as well. More Aces saw the podium upon the conclusion of the 100 freestyle. Senior Michaela Kent paced the Aces with a 50.68 and a fifth place finish. She clocked in a lifetime best in her final individual race of her career. Immediately following was junior Danielle Freeman in sixth place at 50.82. Sophomore Madi Jones competed in the C-Final, recording a 52.75. In the morning's preliminary session, sophomore Kaylee Gubricky recorded a 3 second drop for a lifetime best of 54.61. Junior Kayla Aitken was the sole Evansville representative in tonight's 200 breaststroke final. She scored points for the Aces with a 16th place finish at a 2:23.63, nearly a two-second drop from her preliminary time and a lifetime best. In this morning's preliminary round, freshman Alaina Sylvester logged a lifetime best as well, with a 2:26.45. Sophomore Kristen Myers continued her success in the 200 butterfly. After a two second improvement in the preliminary round, she dropped an additional second to clock in a final time of 2:04.47. Her performance smashed a sixteen year old school record of 2:04.55 set by Emily Tomes in 2001. Myers took the podium for the third time this weekend for fourth place. Junior Kasey Rein dropped a whopping 5 seconds from her preliminary time to clock in a 19th place earning 2:09.74, yet another lifetime best. Freshman Shaina Weisberg took a lifetime best this morning with a 2:11.66. 1-Meter champion Courtney Coverdale took to the boards tonight in the 3-Meter A-Final. A stellar performance earned her a second place finish with a final score of 272.05. The Aces closed out the season with a fourth place finish in the 400 Freestyle Relay. Freeman, Jones, Myers, and Kent clocked in at 3:25.96.